How has a restaurant loyalty program helped Pizzeria Umberto to increase online orders? "A great solution that we have recently implemented has been a loyalty program, thanks to which we build our customers' loyalty, attract new guests, who, in turn, can exchange collected points for rewards, and have fun while doing it." Nowadays, ordering food online is very popular, either directly from a restaurant website or via a mobile application. More than 80% of people look for restaurants or bars online. Approximately 30% of restaurants offer various types of loyalty programs, while 57% of consumers state that they are more likely to buy from places where such programs are offered (source). We will show you, using the example of Pizzeria Umberto, what to do to improve your online pizza ordering system using just such a program. Umberto is a common Italian name, which means "one of a kind", "the unique one". And so is the pizza served in this restaurant - unique, with a special, truly Italian taste and appearance. Importantly, customers can try the dishes from Pizzeria Umberto without leaving home, because the restaurant has an online food ordering system and delivers throughout the city. The restaurant wanted to have an online pizza ordering system on its own website, under its own brand, and integrated with restaurant loyalty software. 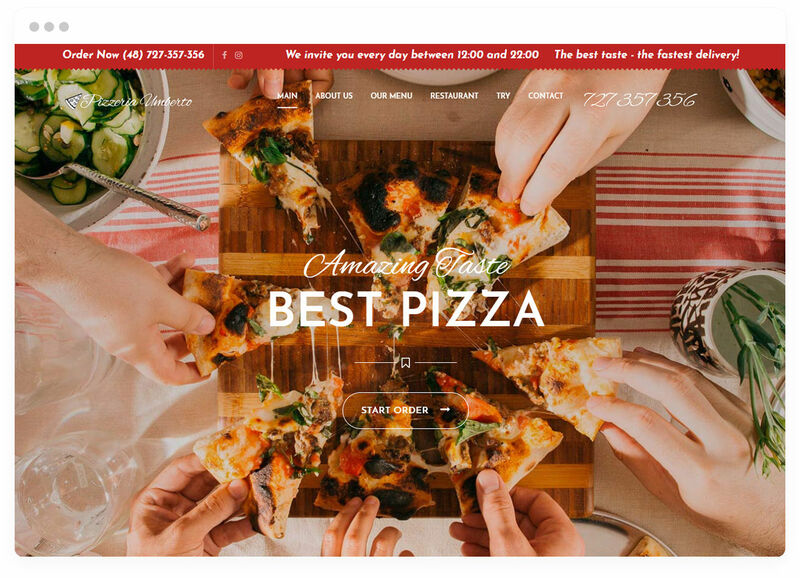 We offered Umberto an online pizza ordering system which resulted in the opening of a new sales channel and, thanks to access to a broad range of marketing tools, also contributed to an increase in conversions, i.e. an increase in the number of people visiting the restaurant website and submitting online orders. The Pizzeria launched their restaurant loyalty program knowing that it was fully integrated with their online food ordering system and that it could be adapted to the brand's visual identity. The points that customers collect are automatically added to every online order, and the total can be checked in the UpMenu system at any time. All the statistics and information about the loyalty program can be found in one place in the UpMenu admin panel. The restaurant can manage all the tools for building customer loyalty from one place. Pizzeria Umberto offers numerous promotions. There is even a special tab on Umberto's restaurant website where you can find available discounts and special offers. In addition to the restaurant loyalty program, other available offers include: 15% off the first online order, 10% off for ordering two pizzas, or a free large garlic sauce with orders over 50 PLN. In addition to publishing its special offers in the "Promotions" tab on the website, and using a pop-up notification, Pizzeria Umberto also let its Facebook followers know that a restaurant loyalty program had been launched, aiming to increase online sales, build the loyalty of current customers, and increase profits. Launching the UpMenu loyalty program and reward system has increased the sales and profits of the Umberto Pizzeria. In addition, the restaurant has given its customers the opportunity to have fun while winning prizes - a great form of entertainment, as we all know. Umberto's restaurant loyalty program and the online pizza ordering system make the customers feel important and appreciated, so they place bigger orders and more often. This is a unique step on the route of effective marketing activities. Online orders in Pizzeria Umberto show an upward trend. Their numbers are gradually increasing. The above chart shows the number of orders from the first three months of operations of the online pizza ordering system, December 2018 to February 2019. The example of Pizzeria Umberto shows that restaurant loyalty program software is a quick and easy way to increase online sales and profits, while taking care of your customers by giving them the opportunity to collect points and stamps and exchange them for rewards. The many marketing opportunities offered by the UpMenu system encourage your guests to place more and bigger online food orders. If you want to have an online food ordering system and a restaurant loyalty program and reward system in your restaurant, get in touch with us. We will be very happy to help you with all that's involved. Check out some other restaurant case studies we have for you.